Key West Oasis (KWO) is a private two bedroom/two bath rental house ideally located in charming Old Town, close to Duval Street, great restaurants, bars and the beach. This 1906 "cigar maker's cottage" has been newly renovated into a stylish Key West retreat. The house features an open floor plan with original Dade County pine walls and ceilings. The main house has hard wood flooring throughout and houses the master suite, a fully equipped gourmet kitchen and the living and dining area. Inside the house are all the comforts of home, with every room providing its own unique feel. Our Key West Oasis Vacation Rental has been renovated and completely redecorated - rooms are painted in soft hues and offer a mix of wicker, shabby chic, as well as new and reclaimed wood furnishings. Three sets of French doors lead from the living and dining area onto your own private lanai and pool area. Bask in the sun and listen to the tranquil sounds of falling water, which is the backdrop of the heated pool. Tropical plants and flowers are abundant and offer complete privacy for guests. The back gardens and pool area were designed to create a calming effect, which pervades the mind, body and spirit. The detached cottage offers a 2nd bedroom and bath with a private open-air shower – what better way to enjoy your morning shower than amidst flowering bougainvillea trees! The cottage also features 20 ft vaulted ceilings and two sets of French doors which open to the garden and pool area. Guests tell us they love having the detached cottage, as it offers couples traveling together much more privacy. Looking for a great resource to help plan your trip to Key West? Be sure to check out my Key West Travel Board on Pinterest. Get a ton of information on fun things to do, restaurant recommendations, where to go for the best happy hour, must see places in town etc. Key West Oasis is a 100% legal and licensed transient Key West rental property. 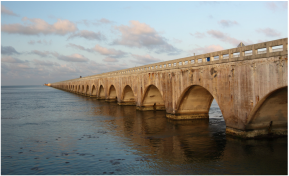 Be sure to look for all the GTK's (Good to Know) throughout this website for interesting facts & helpful tips to make your Key West trip go smoothly. GTK: Believe it or not, chickens and roosters have been given Protected-Species status in Key West. No rooster swatting allowed! Rental prices range from $2,900 - $4,300/per week (depending on the season and event), plus 12.5% tax and a $500 refundable security deposit (Repeat guests do not have to pay a security deposit). I never nickle and dime my guests, so there is no need to worry about hidden fees. GTK: Guests can pay directly through the Make a Payment Portal and will avoid paying "Service Fee's" that are charged on Booking Sites. See whats going on in this quirky little town. The Key West Oasis Vacation Rental Calendar is updated on a daily bases. A 7 night minimum is required at all times. Key West was named "America's Hottest New Luxury Destination in 2015" according to Forbes. The Old Town section of Key West is listed on the Department of the Interior's National Register of Historic Places and contains the largest and most important concentration of historic wooden buildings in Florida. During the 19th century, the production of hand-rolled cigars was Key West's largest and most influential industry. At its peak, there were over two hundred cigar factories. With the public's increasing demand for these cigars, so was the need to house the industry workers. Many homes were built during this time to fulfill this housing crisis - these homes came to be known as "Cigar Makers Cottage". The property at 1114 Varela Street was built in 1906 and was originally built to house a Cigar Maker and his family. Today, it is known as Key West Oasis and is a 2 bedroom/2 bath vacation rental property, perfect for couples or families traveling together. Key West Oasis Vacation Rental is a Licensed Transient Key West Rental Property and a Certified Property in the American Vacation Rental Owners Association. 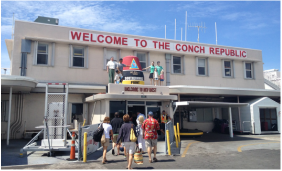 The Key West International Airport (EYW) is only 2.8 miles from KWO, less than a 10 minute taxi ride. Several major air carriers schedule regular service to Key West International Airport, including American, Delta, and United. Many flights are routed through Miami International. GTK: If you are routed through Miami, be sure your layover is at least an hour. Miami is a HUGE airport and you will most likely have to take a shuttle to your connecting gate. 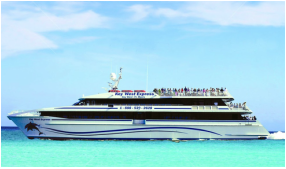 Another fun option to get to Key West is to take the Key West Express, a ferry that cruises the gulf with departures from Ft. Meyers and Marco Island, FL. The Key West Express has air-conditioned interiors, several exterior sun decks, tables, and even reclining airline-style seating. There’s even a full-service galley, full-service bar, and flat screen TVs with satellite television to watch during the duration of the ride. Travel time from Ft. Meyers/Marco Island to Key West is 3.5 hours.